THE REPTILIAN SESSION "S/t" LP - Coming Soon! THE REPTILIAN SESSION « S/t » LP to be released end of April. Italy’s THE REPTILIAN SESSION, featuring core members of Black Thrash misfits VESPER and FINGERNAILS, release their awaited first full length record of cold blooded Black Metal, the follow-up to their critically acclaimed demo tape which Decibel Magazine and Morbiddeceiver (Nunslaughter) awarded as best demo cassette release from the year 2015. 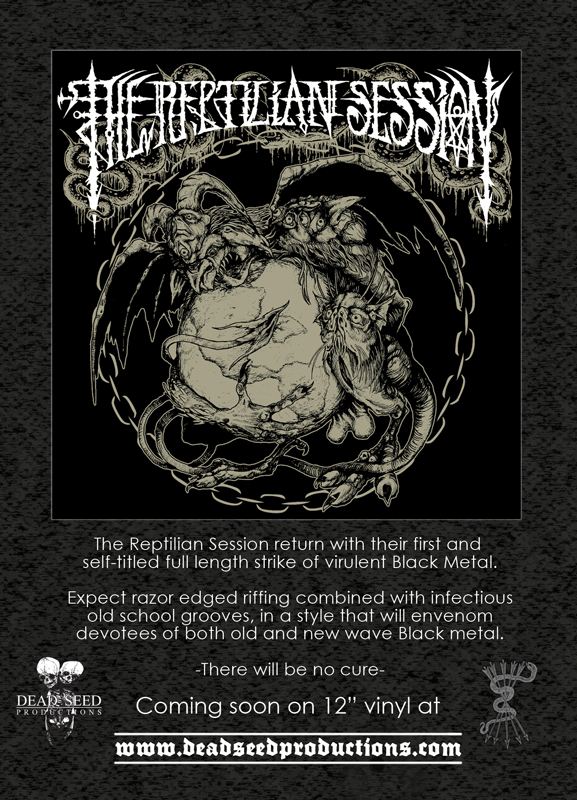 THE REPTILIAN SESSION execute virulent Black Metal, combining razor edged riffing with infectious old school grooves, in a style that will appeal to devotees of both old and new waves of Black Metal. Featuring guest vocals by Fabban (Aborym), a remixed track by Sirio Gry J (owner of reputable avantgarde techno label Monolith Records) and a cover track of Bahaus’ timeless classic « Double Dare ». Recorded at Subsound Studios by engineer Luciano Lamanna.